XOF is not the exit for Offenbach, nor an old-fashioned precious metal, but the currency code for the CFA Franc. The West African CFA franc is the currency of eight independent states in West Africa: Benin, Burkina Faso, Guinea-Bissau, Ivory Coast, Mali, Niger, Senegal and Togo. The acronym CFA stands for Communauté Financière d’Afrique (“Financial Community of Africa”) or Communauté Financière Africaine (“African Financial Community”). The currency is issued by the BCEAO (Banque Centrale des États de l’Afrique de l’Ouest, “Central Bank of the West African States”), located in Dakar, Senegal. Interestingly, it was practically pegged to the EUR until summer 2017, as it was formerly pegged to the French Franc, see Figure 1. After this there have been some jumps when the peg has been moved. A peg should imply that the XOF interest rate must match the EUR interest rate, as otherwise there could be an arbitrage opportunity: buy XOF for your EUR, deposit them with the BCEAO, then change back to EUR after a month at presumingly the same spot reference and finally get the interest rate on the EUR that you think you deserve. 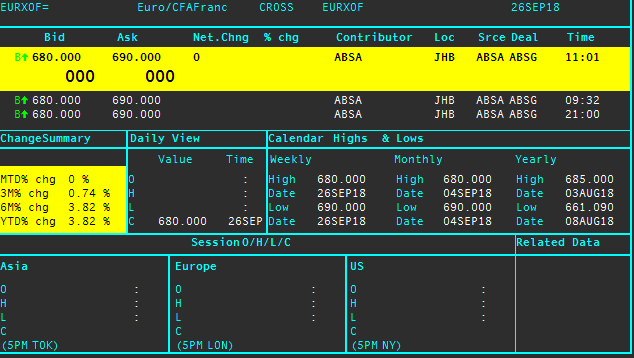 How about market data: I see a spot of 680 – 690 bid – offer by ABSA bank in Johannesburg in Eikon (Figure 3), but also a spot of 648.90 – 657.22 on Eikon’s Euro/CFA France page EURXOF (Figure 2), XE.com shows a 10-year low of 655.88259, a 10-year high at 656.01663, and a closing spot of 655.957. 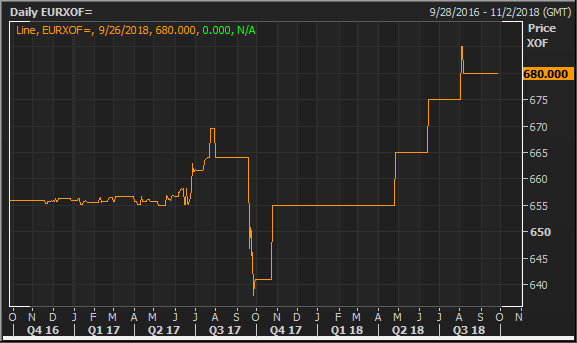 SuperDerivatives’ FX Option pricer shows a spot reference of 652.47 CFA Franc per EUR on 28 September 2018, so it may not have updated the spot since summer 2017. While XOF seems pegged to the EUR, there is a lively forward market with quotes as shown in Figure 2. The historic spot as indicated by SuperDerivatives is shown in Figure 4. Notably it appears different from the spot recorded by Reuters in Figure 1. It remains opaque to me where the spot is and also how the historic spot is recorded as there are obvious differences in XE, Reuters and SuperDerivatives. 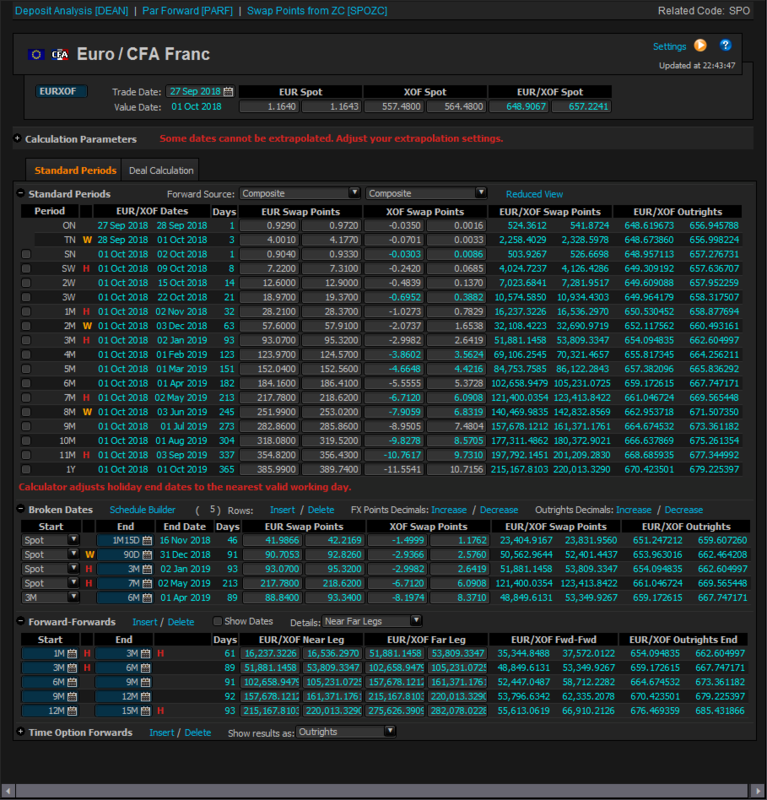 However, the spot rate appears to be pegged with a bid-offer of 8 XOF per EUR as per observed quote in Eikon, higher fluctuations in SuperDerivatives probably due to illiquid and scattered transactions. Calculated cross rates are exhibited in Figure 5. Notably, even if the CFA Franc is expected to be closer to the Euro, the EUR/XOF exchange rate is calculated as a cross rate between EUR/USD and USD/XOF. Turning to the interest rates, we see a one-year deposit rate of -0.475% in EUR in SuperDerivatives, keeping in mind that deposit rates in the FX option pricer are pre-calculated to match the FX forward. 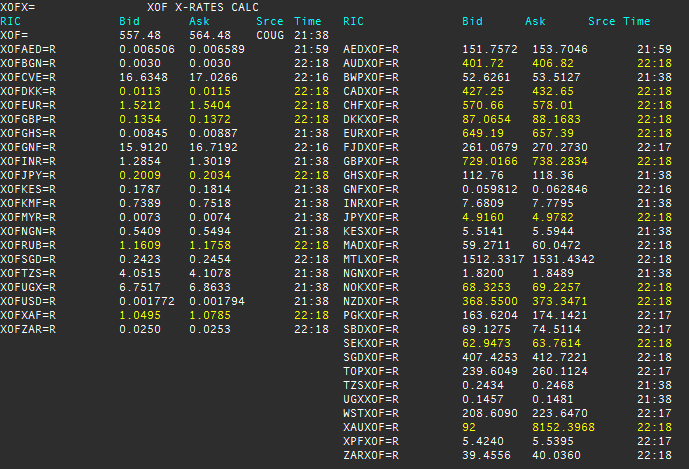 The XOF interest rate shown in SuperDerivatives is +2.781%. 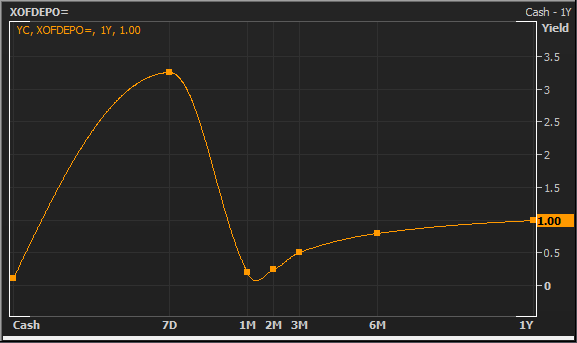 Reuters calculates a rate curve in Figure 6. 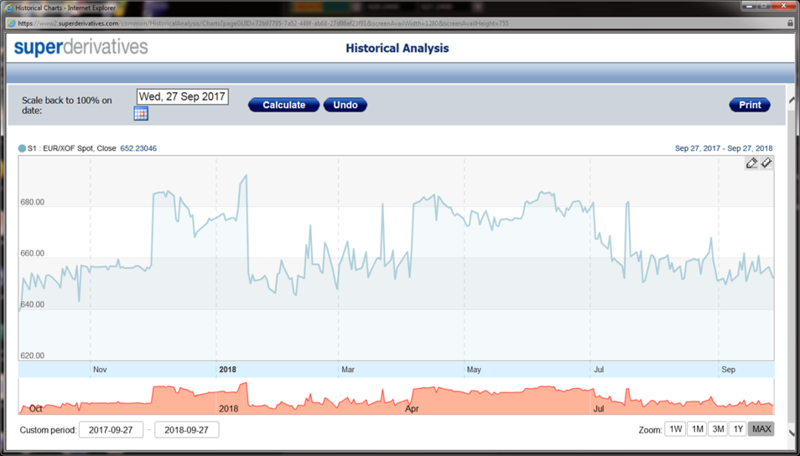 The Central African Central Bank shows a rate of +2.95% on their web page https://www.beac.int/ . While the forward rates in Figure 2 seem to reflect the difference of interest rate in principle, the pegged spot would actually call for an arbitrage opportunity, especially for a 1-week deposit when we consider the yield curve. The CFA France is a very interesting example of distortions in the market. The credit fan club will now probably start calculating the probability of the BCEAO defaulting. The difference of rates is a strong indication that the peg will have to break over and over again. I didn’t find any volatility data; currently in Africa we see only volatilities for ZAR (South African Rand) and KES (Kenyan Shilling). XOF may not need any FX options, as one can trade options on EUR instead. Otherwise, the relevance of the West African economy would actually call for options, too. Let’s see. Good luck with your interest rate arbitrage! With a blend of world renowned speakers from academia and industry providing cutting-edge research and brand new practical applications this event is a must for everyone in the quantitative financial industry. We expect around 100 delegates ensuring a unique networking opportunity which should not be missed. More information on the conference and registration to soon follow.